Enhance your everyday sparkle with the Nina Ricci Nina Eau de Toilette Spray, a fruity floral gourmand scent for women with toffee apple facets. A modern-day fragrance icon, this sparkling, sweet scent is tempting, gentle and magical. Inspired by an impulsive woman that is confident in following her heart and chasing her dreams, the Nina Eau de Toilette scent is dedicated to happiness, youth and recklessness, encapsulating an iconic love story that has withstood the test of time. The Nina Ricci Nina Eau de Toilette Spray opens with sharp splashes of lemon and fizzy lime caipirinha that spill over into the core. Sticky notes of toffee apple melt over creamy facets of vanilla in the heart, stirring the warm and feminine base of sugary cotton musk and white cedar. 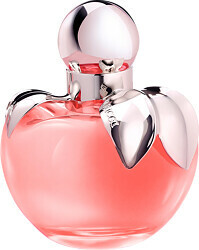 Nina Ricci Nina Eau de Toilette Spray is rated 4.4 out of 5 by 7. Rated 5 out of 5 by Ruslana from fairy tale NINA I feel like Cinderella with Nina fragrance. Incredible sweet design of the apple bottle, fantastic smell and the perfect model (of earlier Nina scents) Ruslana Korshunova! LOVE Nina since years and collect all the editions of Nina! Rated 2 out of 5 by marie20 from A lighter refreshing feminine scent and lasts well for EDT , comes in a beautiful bottle which I must admit I prefer more than the perfume itself! Rated 5 out of 5 by AKumari from If you like something that's sweet, light and fresh, go for this perfume! Its quite long lasting unlike some EDT fragrances so you won't be disappointed. Rated 5 out of 5 by pinkie from Excellent in all ways. This is the first time i have used Escentual and it won't be the last. I found it very easy to order, the perfume was as i expected, lovely smell and not to overpowering. Great delivery arrived next day! and very good value. I did not take advantage of the gift wrap this time, but may on future orders.